In their search for the origin of blunt, etymologists roamed long and ineffectually among similar-sounding words and occasionally came close to the sought-for source, though more often look-alikes led them astray. One of such decoys was Old Engl. blinn. Blinn and blinnan meant “cessation” and “to cease” respectively, but how can “cease” and “devoid of sharpness; obtuse” be related? Did the etymologists think of the loss by blunt things of the ability to cut? The verb blinnan goes back to be-linnan, in which be– is a prefix, the circumstance that makes its connection with blunt even less likely. Then there is final t, mentioned as a serious stumbling block last week; it has to be accounted for. Surprisingly, the Middle English Dictionary returned, though hesitatingly, to the blunt—binnan idea. In my short survey, I would have skipped this etymology if it had not been given a second/new lease on/of life (second/on is American, new/of is British) and if its originator were a figure of lesser importance than Horne Tooke, a man whose influence made itself felt for at least a century. His fanciful conjectures found their way into several authoritative dictionaries of the past. German regional bludde “a dull or blunt knife” turned up in Mahn’s revision of Webster (1864), but no one seems to have noticed, let alone accepted his derivation. I will not discuss in any detail the attempts to trace blunt to Greek amblús “blunt.” The pair looks almost perfect at first sight (both Junius and Noah Webster promoted the connection), but, unfortunately, there is no chance of linking the two words. More promising was the suggestion that the English adjective is sound-imitating. In chasing the origin of blunt and its cognates this suggestion is probably the earliest of all (1599), and it returned, though somewhat improved, to an important modern dictionary. But what is sound-imitating in blunt? Blood sausage. See the advice at the end of this post. The word reminded some researchers of Latin plumbum, because (I quote) “lead being sharpened, holds no edge.” This is how the childhood of etymology looked like. In 1859, that is, 160 years later, Hensleigh Wedgwood’s English etymological dictionary began to appear (in installments, as usual). Wedgwood wrote that Swiss bluntsch, blunsch represents the sound represented by English plump and German platz. “The term blunt is then applied to things done suddenly, without preparation…. A blunt manner is the unpolished, unceremonious manner, exactly corresponding to the German plump.” Perhaps so, but the path from plump to blunt “dull” could not be as straight as Wedgwood would have us believe. I’ll add that, according to Otto Jespersen, a great linguist of the past epoch, plumbum, the Latin name of lead, got its name because, when a heavy piece of metal was dropped into water, it produced a sound like plump. However, he said nothing about blunt. This is all well and good, but the question arises whether blunt indeed arose as a word imitating the sound of a fall. Onomatopoeia, once we step outside moo, oink-oink, and their likes, is always hard to prove. In the German Standard, the adjective for “naked” is bloß. Its ancient root was blaut-, as in Old Engl. bleat (long ea; no connection with bleating!). I suppose that Mahn’s bludde “a dull knife” is akin to German (also dialectal) blutt “bare, naked,” regardless of whether either of them has anything to do with bloß. From a phonetic point of view, Old Engl. bleat can be related to blunt; the vowels are compatible, n in the middle of a root is a common phenomenon (a so-called infix: compare stand versus stood), and final t looks like an old suffix of an adjective. In my reconstruction (below) I will also assume that n is an infix and t is a suffix. But blunt “naked” seems to be an occasional sense, a poeticism in the history of our adjective, a poeticism, and the idea of the semantic progress from a sound to nakedness is unsupportable. Murray (naturally) knew the old etymologies of blunt and found all of them wanting. Soon after the publication of the first volume of the OED, an attempt was made to show that blunt could, after all, be the past participle of Old Norse blunda “to doze,” but neither the material nor the reasoning went far enough. Last week I said that I was aware of only one post-1884 guess about the origin of blunt along the same lines as those touched upon above. Ferdinand Holthausen, though a cautious scholar, suggested that blunt might be a blend of blind and stunt. Blends are like onomatopoeia; unless we know for certain that we are dealing with a “portmanteau word” (as, for instance, with smog = smoke + fog), we can never prove that the word before us is a blend. In any case, blunt is hardly a Middle English sum of blind and stunt. Did Blunta of Old English fame look like this gentleman? Very long ago (at least as early as 1913), blunt was compared with German dialectal Blunze “a fat man; a formless mass.” The word is also known in the Standard with the sense “black pudding; blood sausage.” The Middle High German verb blunsen meant “to swell up,” and Elmar Seebold, in the latest edition of Kluge’s German etymological dictionary, suggested that the verb has a sound imitating origin. That is what I meant by the return of an old hypothesis. But once again, as with Wedgwood, the nature of onomatopoeia remained unexplained. No doubt, what swells to capacity tends to burst and go phut, but blunsen did not mean “to burst.” In my opinion, a much better solution was offered by Bertil Ejder, who in a 1966 article investigated the Swedish place names Blentebier and Blentetorn, compared the element Blente– in them with Engl. blunt and the German blunz– forms, and suggested that all of them are related to the words in which b-l (the hyphen stands for a vowel) means “to swell” (ball, belly, bull, and many others). Whether this ancient root is of sound-imitating origin is a moot question that need not delay us here. The moral of the story is: study etymology but don’t eat too much blood sausage. Image credits: (1) Opinel + Coticule : sharpening the knife on a coticule from Vielsalm in Belgium. Photo by Xofc (Wikimedia user). CC BY-SA 4.0 via Wikimedia Commons. 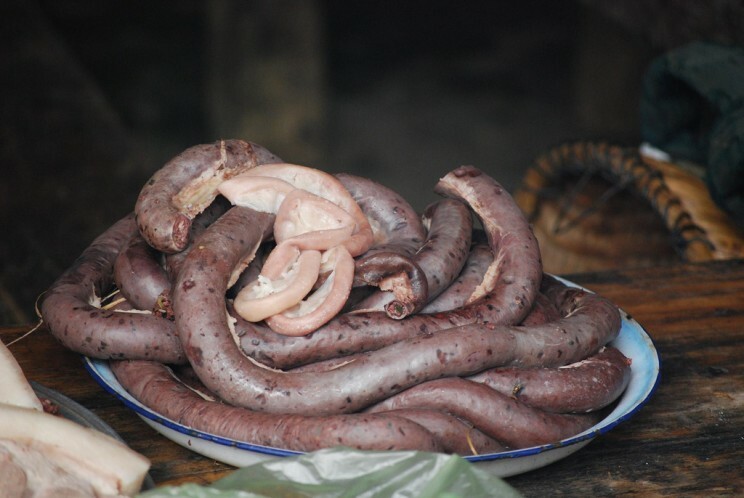 (2) Blood sausage with lemongrass. Photo by Alpha. CC BY-SA 2.0 via avlxyz Flickr. 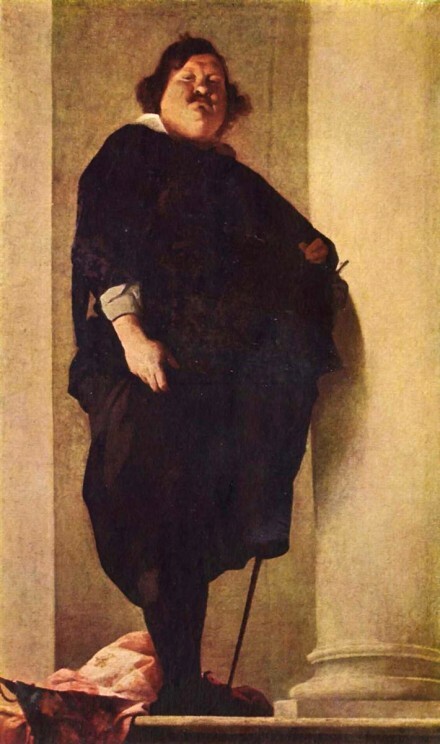 (3) Portrait of a fat gentleman by Bernardo Strozzi. Public domain via Wikimedia Commons. As an etymology enthusiast, I begin to enthuse about Hensleigh Wedgwood’s etymological dictionary these days. 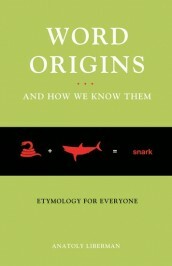 I’ve downloaded two editions of it from archive.org, plus “Contested Etymologies …”. But where can I get the last edition of this dictionary published in 1888? The replicas on Amazon or Abcbooks are all of the first three editions. Is a book published in 1888 still under copyright protection? For curiosity, how does it differ from the previous editions? I find the 3rd 1878 edition adds only two appendix pages to the 2nd 1872 edition.